The circle of life. We all know it. You are born, live, love, and if we are blessed and lucky enough, we are loved by a pet. A dog specifically. They love you unconditionally in the rain and sun, all day, every day, in good times and in bad, when you are happy and sad. They give you so much without even knowing it – they worm their way into our life and heart. We have always had dogs in our family since our first lab, Jasper in 1986. Jasper of Burllynleigh from PEI. She was an amazing dog who was with us for almost 12 yrs. Then along came Shadow who we picked up in a garage shop out in Langford. He was our introduction to rotti’s. He was a mixed Rotti-Shepherd. When we first got him, his separation anxiety was huge and he chewed through an outdoor settee. That being said, he was an awesome dog and huge part of the family. Then along came Sambucca, another rotti-mix. We got her up in Black Creek while visiting my brother. Here is another one who wiggle her way into your heart. She was a lady, always crossing her paws and so polite. After we said good-bye to Shadow, we assumed Bucca would be lonely so along came our second lab, Mac. We brought him home from Duncan on February 4, 2009. We had Bueller, another rotti, who left us too early. Currently we have our rescue, Kona – who was to be 65 lbs and is now 105 lbs of love, who joined us in spring 2015 at 14 weeks old and this spring, Gibbs, a Mastiff-Boxer, another rescue came into our world. 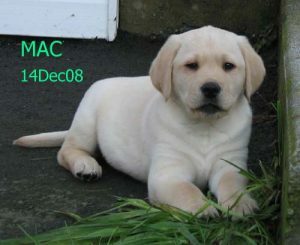 Mac was born December 14, 2008 in Duncan. He has always been your typical lovable food oriented lab. 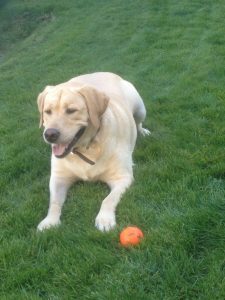 He was a goofy guy, tail always wagging, loved his ball, swimming, running and being with his people. Mac would always bring me my slippers in the morning. He never chewed them, would just bring them. If you didn’t put your shoes away, he would always bring you at least one of them. Camping with us was always something we think he looked forward to. All the dogs had camping as part of their life with us. Mac was always by your side, hoping for a cookie or treat I am sure. He was gentle and loving with the little ones who came by and into our world. Mac – our friend and buddy. It is with a heavy mournful heart that Mac is leaving us today. We tried antibiotics, dexamethasone, prednisone and a few others. It appears that he has lymphoma along with some liver issues. He is no longer wanting to eat, his breathing is laboured and the happy sparkle is no longer in his eyes. I know his tail will keep wagging right up to the end. You were a loyal faithful friend. We will miss you terribly but know we will meet again at the Rainbow Bridge. Thank you Mac for all the love you gave us unconditionally & faithfully. You made us better humans by being in our world. May you run, fetch, swim and play all day with Jasper, Shadow, Bueller & Bucca and rest at night on a warm bed. Previous story Two Thousand and what?